If you don't have a sense of humour then stop reading now because this film is not for you so just back away from the computer and go find your sense of humour and then you can come back and read this. When I was settling down to write this my first instinct was to just write "This has Tom Atkins in it so why aren't you watching it already?!" but I figured I should go in-to a little more detail. Writer and Director Fred Dekker ("House", "House II: The Second Story", "RoboCop 3", "The Monster Squad") delivers a fantastic film, he's able to capture the humour of the time without sacrificing a great story-line. Our 2 misfits, Chris & J.C. are perfect characters that we are able to relate to. Played by Jason Lively (Chris) and Steve Marshall (J.C.), they may not be the best actors in the world but they give a solid performance as our outcasts trying to fit in to their new surroundings. As I mentioned before Tom Atkins features in the film delivering great one liners and playing his usual tough cop routine that he's loved for. As always he puts in an amazing performance and takes the film to a higher level. Also the effects in the film are great, it shows that you don't have to go over the top to produce good work. 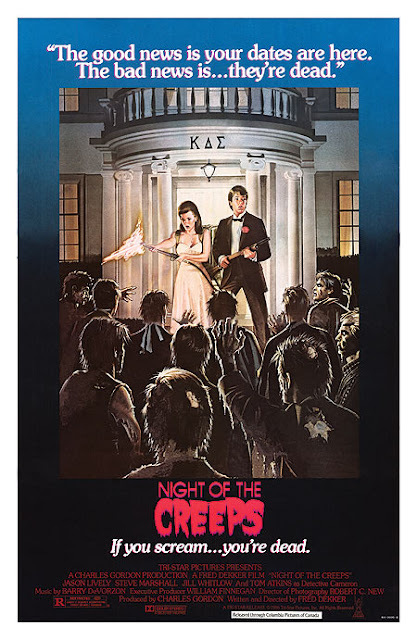 "Night Of The Creeps" is easily one of the greatest Horror comedies, not just of the 80's but of the entire genre. How this film hasn't got more recognition over the years I'll never know. Same goes for Fred Dekker, the guy did some great work yet the offers never came rolling in, It's a head scratcher. The film is great 80's cheesy fun, as-long as you don't take it too seriously then you're in for 90 minutes of pure entertainment. Also this has Tom Atkins in it so why aren't you watching it already?! Gregory Nicotero and Howard Berger play Zombie extras. "Corman University" is a reference to director/producer Roger Corman. Grafitti on the wall of the men's room where J.C. is trying to escape a number of slugs reads, "Go Monster Squad!". The Monster Squad was also directed by Fred Dekker. The movie the house mother is watching on TV is Plan 9 from Outer Space. Tom Atkins came up with the idea to have Detective Ray Cameron stop and smell a rose in one particular scene. A fair share of the film was shot in an old Woolworth's department store that was converted into a makeshift studio. The tool shed sequence was filmed after principal shooting on the movie had wrapped. After a rough cut was shown to a test audience, several people thought that the picture needed more action so this particular sequence was added to the movie. Allan Kayser had his hair dyed blonde to play Brad in the movie. Gordon the Cat was named after film producer Gordon Carroll. Jason Lively also auditioned for the role of J.C. The characters of Chris and J.C. were also featured in an early short film made by writer/director Fred Dekker. According to director Fred Dekker the prominent "Stryper Rules" graffiti visible in the bathroom scene appeared due to makeup artist Kyle Sweet's (1956-2009) relationship with future husband, 'Stryper' frontman Michael Sweet.